Would you like free Maintenance Products for a Year? Now is the time to take advantage of our April offer! 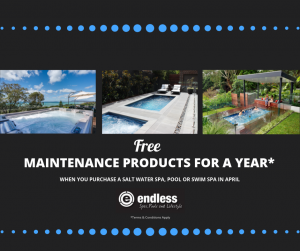 Purchase any Endless Salt Water Spa, Pool or Swim Spa in the month of April and you’ll receive a Maintenance Product Package FREE! With $400 worth of products April is the perfect time to make your backyard Endless. An extra set of Filter Cartridges, Sanitiser, Filter Cleaner, Testing products, Balancing products, Oxidisation Sachets, Surface Cleaner, and a 24 Month E-Club Membership where you’ll receive 15% off any future ShopEndless purchases! 2 Onsite Pool Cleans (within a 40km Radius of Lynbrook), On-site Probe Clean and Maintenance Check, a blend of Minerals to transform your pool, additional Pool Salts, Testing products and a 24 Month E-Club Membership where you’ll receive 15% off any future ShopEndless Purchases! Call (03) 8769 7300 NOW to speak to a pool and spa consultant and request a quote. Visit our Showroom open 7 days in Lynbrook. A Free Maintenance Product Package will be supplied with any new purchase of an Endless Salt Water Spa, Swim Spa or Pool during the month of April 2019. The Maintenance Product Package will be supplied at time of delivery of the spa, swim spa or pool. All free onsite pool cleans must be used within 12 months of installation. The maintenance package is limited to the specified products by Endless and does not include future supply of any products. This Promotion is not in conjunction with any other offer. Promotion ends 30/4/2019.